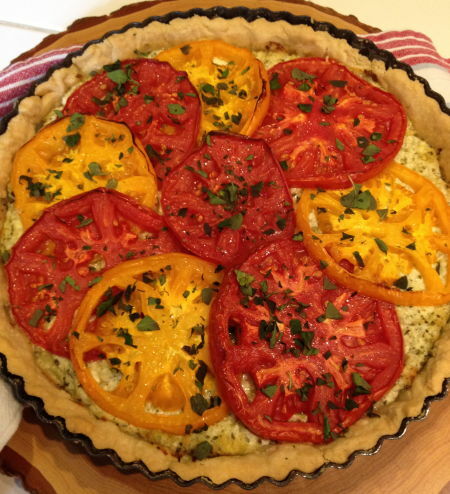 Tomato Tart - Get the Good Stuff! Inspiration! A tomato tart, bursting with flavor. To control the moisture in the tomatoes, I sliced two big ones and laid out the slices on a triple thickness of paper towels to drain a bit. I salted the slices lightly, then covered with more paper towels, and let them stand while I formed and blind-baked the pastry shell. I used a standard 3:2:1 pastry, blind-baked at 325˚. Combine the filling ingredients, and spread evenly in the bottom of the tart. Top with drained slices of tomato. Spray with a bit of olive oil, or drizzle oil on the top. Bake at 425˚ 15-20 min, until the filling is hot and the edges of the tomatoes are just beginning to brown. Let stand 15 min, sprinkle with herbs (I used fresh oregano) and serve. Also good at room temperature. CSA week 11: jalapeños - Get the Good Stuff! CSA week 6: the first tomatoes! | Get the Good Stuff!